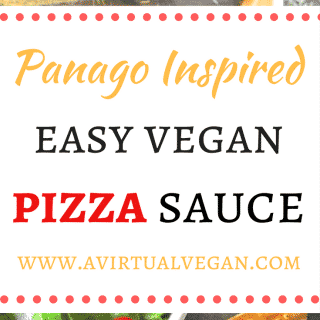 A hearty & rich vegan pizza sauce with an intense full flavour for when you have the time to cook, or take out Panago vegan pizza, crisp tasty salad & organic juice for when you don’t. Sound like a plan? Add even better, you might even get it for free if you enter my giveaway! You all know I love to cook, and wherever possible I make everything myself from scratch. This includes pizza when the mood takes me. 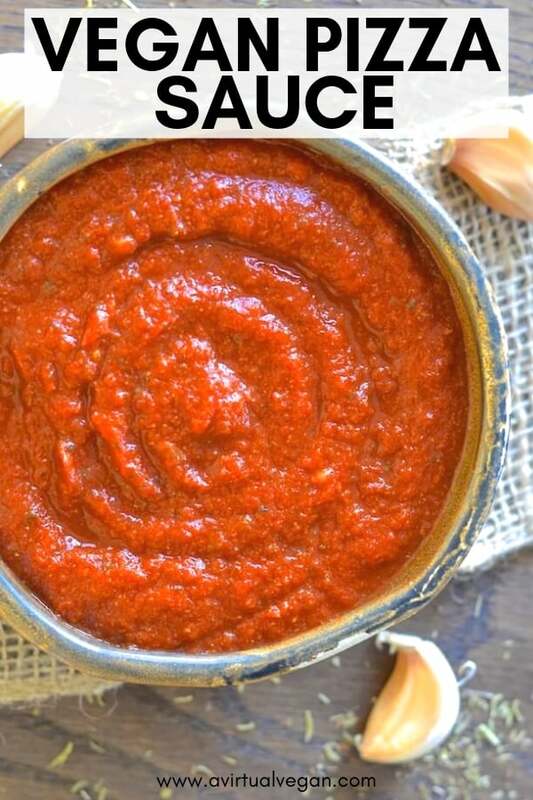 There is nothing more satisfying than making your own dough, spreading it with delicious homemade sauce (find my Easy Vegan Pizza Sauce recipe below) and piling on those toppings. Except when you have been in the kitchen for what feels like days on end and can’t bear to cook one more thing (yes that does happen to me sometimes), or you’ve had a really long day at work and just want to collapse on the sofa. On those occasions I do resort to takeout, but that brings it’s own problems when you are the only vegan in the family. Let’s face it, there aren’t many takeout places that have vegan options and when we do find one, my son being the fussy teenager he is, says he doesn’t like anything on the menu. I have ended up dreading those nights when we decide to order in as we always argue over what to get and inevitably end up getting food from different places. Then it arrives at different times, we all end up eating separately, and it just doesn’t make for a relaxing evening, which is supposed to be the whole idea behind takeout. Imagine my surprise when I did! 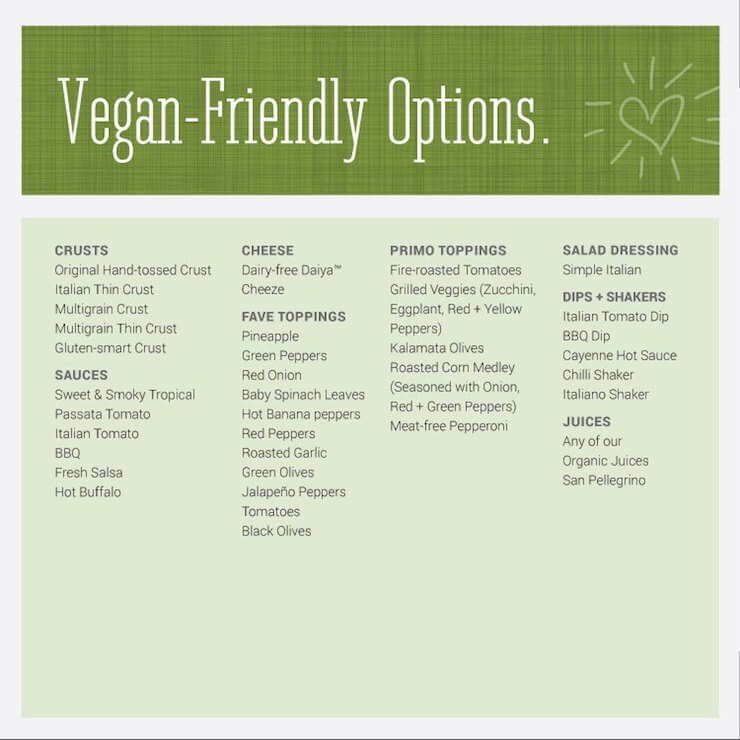 Yes there is a takeout pizza place that offers vegan options. 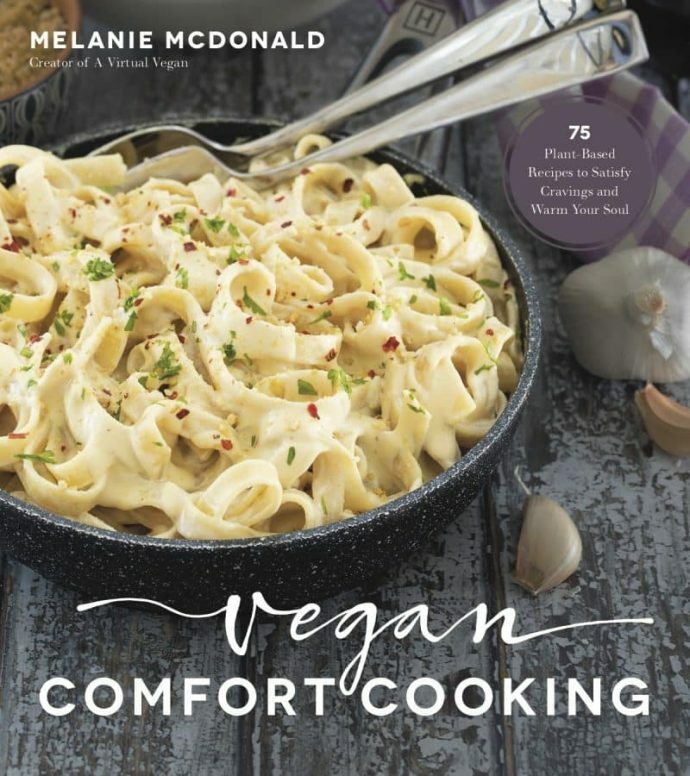 And these vegan options aren’t just an afterthought either! This wonderful corner of vegan heaven is called Panago Pizza and they are all over Canada! 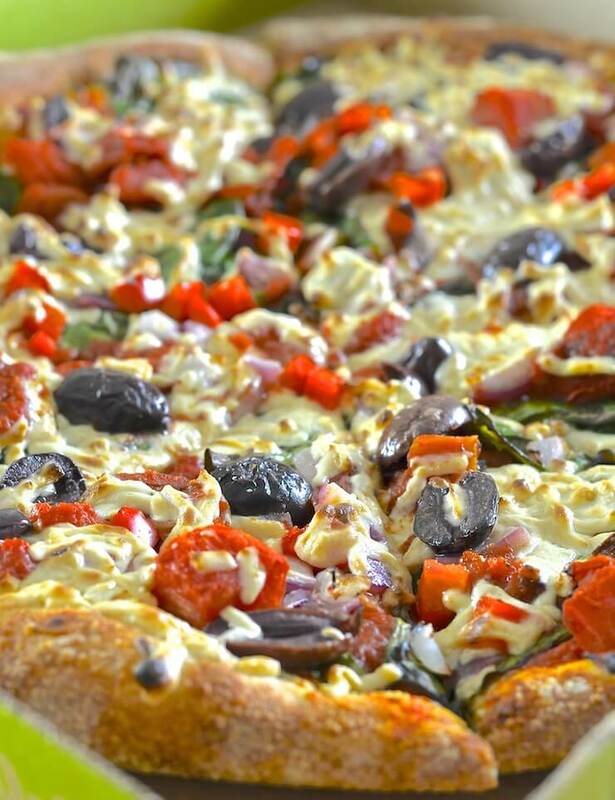 Every single one of Panago’s pizza bases are vegan. Yes, all five of them! 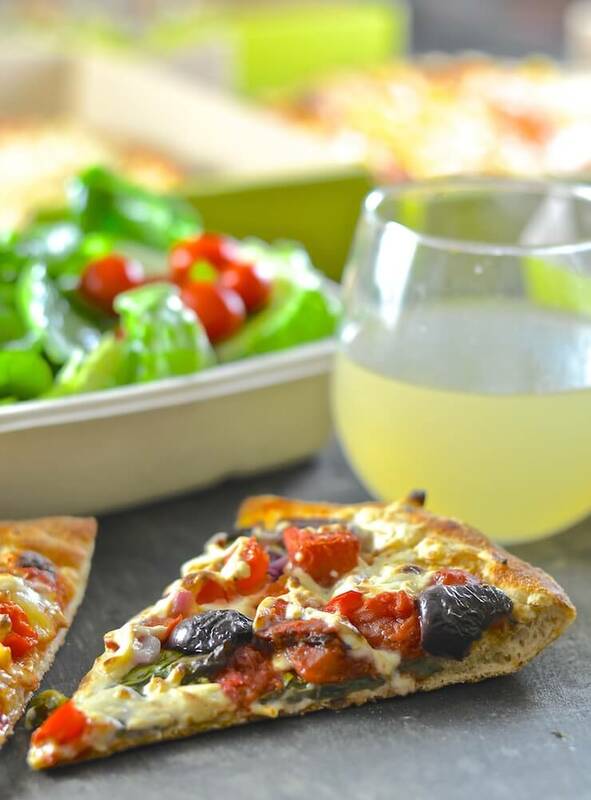 They offer a choice of six different vegan pizza sauces, dairy-free cheese, lots of different delicious toppings, vegan salads, vegan salad dressing plus the usual selection of pop plus organic juices! Before I was vegan I was never a fan of takeout pizza. 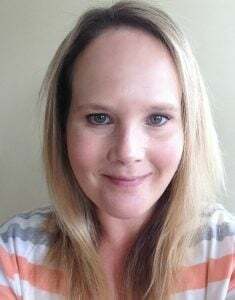 I was concerned about the quality of the ingredients, it was always super greasy and I inevitably ended up feeling bloated and had a tummy ache the next day. I was so pleasantly surprised with Panago. They never add MSG to their food (unlike many pizza chains) and they don’t use artificial flavours or colours. Their crusts are freshly made, never frozen and they source high quality ingredients. I got to try four different pizzas on a mix of multigrain and hand tossed original crusts. I was really impressed with them all. The crusts were just the right mix of chewy and soft and were perfectly blistery in places. The pizza sauce was tasty and the toppings delicious. Highlights for me were the big meaty chunks of fire roasted tomato, the vegan pepperoni (yes they have vegan pepperoni!!!) and the plump, soft, juicy kalamata olives. No cheap little black ones from a can like you might expect on takeout pizza! Panago uses Daiya cheese on their vegan pizza and I was slightly concerned I wouldn’t like it. I have tried Daiya’s Cheddar style shreds in the past and really didn’t like them. It was with trepidation that I took my first bite and it turns out that the Daiya Mozzarella Style Shreds are much better and great on the pizza. There was just the right amount and the balance of flavours was perfect. I am now a partial Daiya convert (the cheddar style shreds will never cross my lips again but I will buy the mozzarella from time to time and am open to trying the other varieties too). I tried Panago’s Mediterranean salad too (minus the feta). All too often salad is a bit of an after thought when you order takeout. Not at Panago though. The salad was large, super fresh and crispy with a great mix of romaine lettuce, baby spinach, bell peppers, red onion, sweet grape tomatoes and more of those delicious juicy kalamata olives. 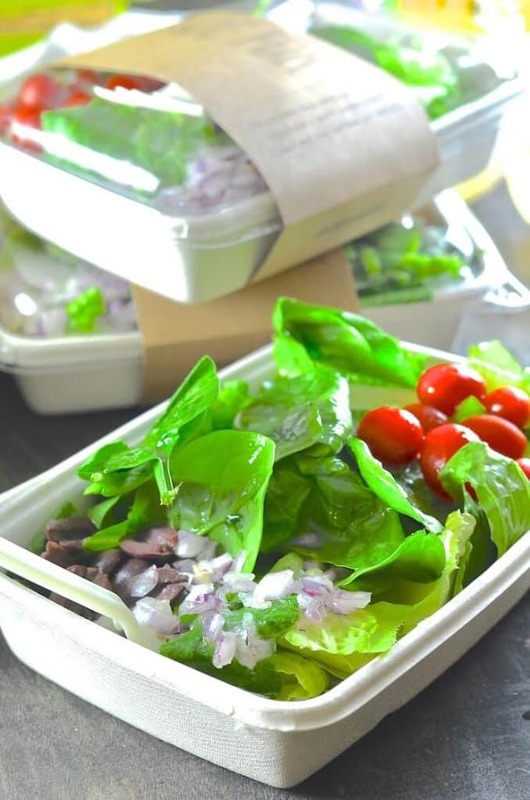 It even comes in compostable packaging! 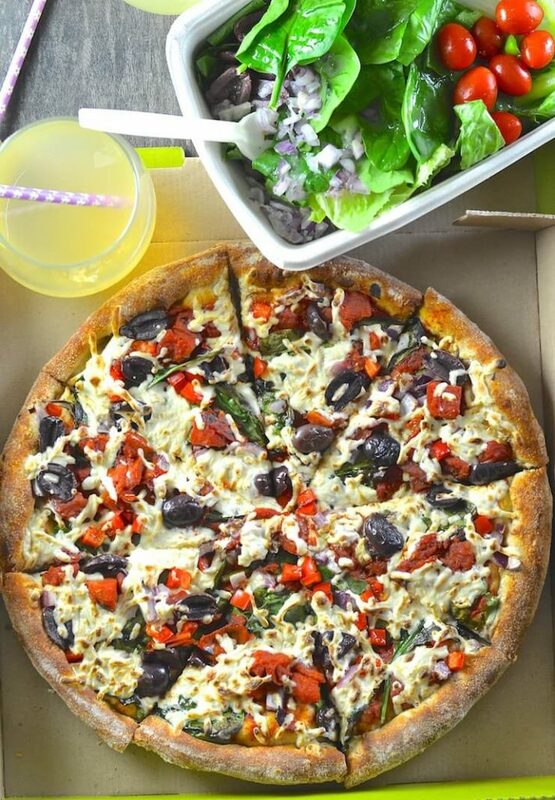 Make lemonade….Or let Panago make it for you. The have a range of organic juices and I got to try the lemonade. I don’t really drink fizzy drinks so was pleasantly surprised to find that it is the old fashioned not fizzy type. 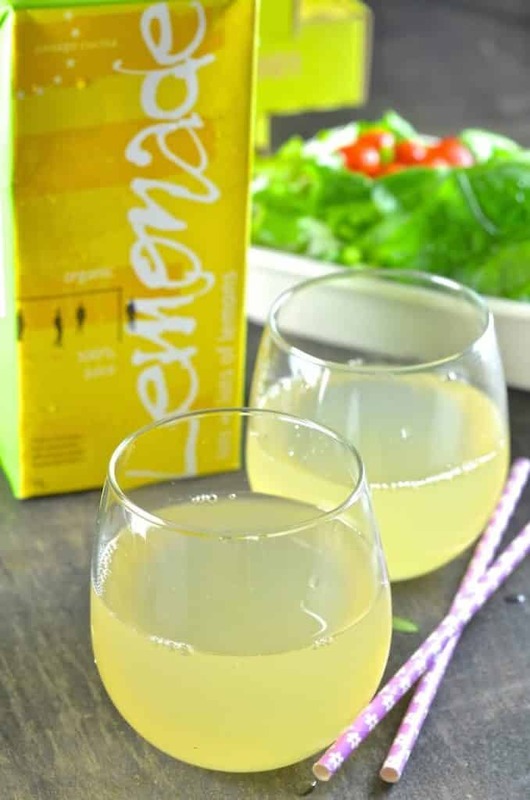 It is made from organic grape and lemon juice and even more surprising is that it contains no added sugar. I was super impressed with this and the flavour was great. Just the right balance of tart and sweet and no post sugar slump to deal with after. Even better! 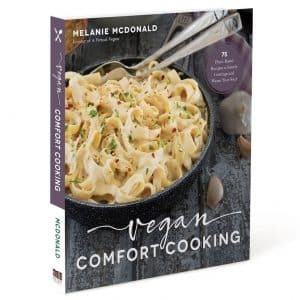 You can find the giveaway details directly below my Easy Vegan Pizza Sauce recipe. If you have some spare time and want to make your own pizza then here is a great Easy Vegan Pizza Sauce Recipe. It is rich, flavourful, thick and delicious. 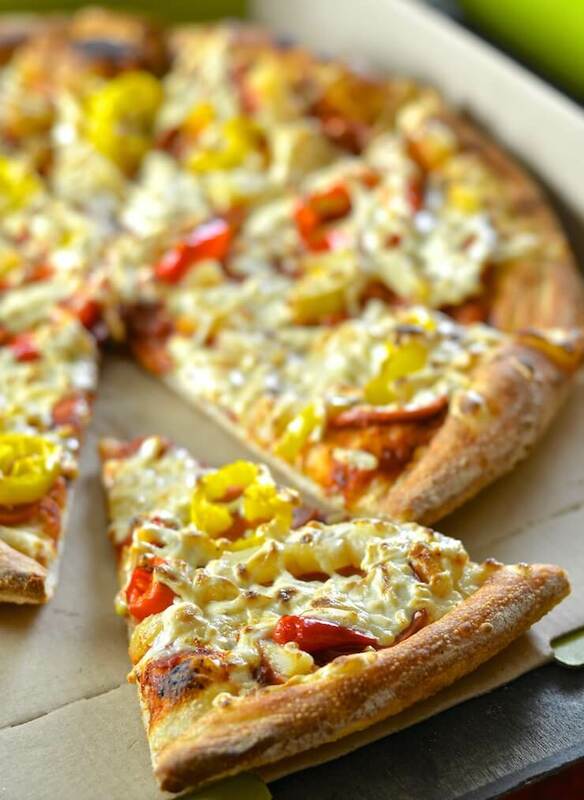 If you need a quick and easy pizza dough recipe then you can use the dough part of this recipe. It can be ready in less than one hour! And don’t forget to enter my giveaway below the recipe! 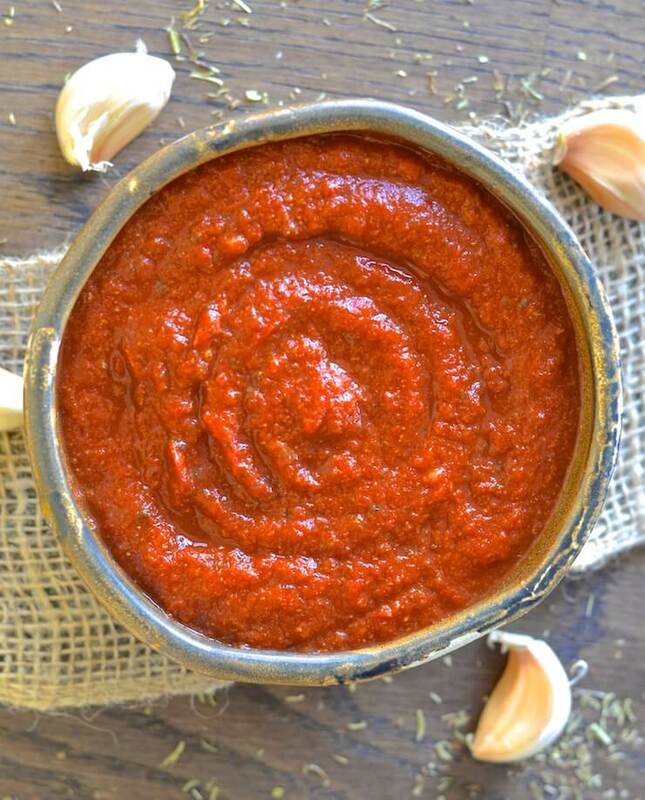 A hearty & rich vegan pizza sauce with an intense full flavour. Sauté the garlic over a medium heat until just starting to brown. Use a couple teaspoons of water to do this if you like to cook oil-free or a tablespoon of olive oil if you prefer. Add all of the other ingredients to the pan and stir well to combine. When it is just starting to bubble turn it down to low and simmer gently for up to 30 minutes ( it doesn't technically need to be cooked as it's going on the oven on the pizza anyway, but the longer you allow it to simmer, the deeper the flavour gets). Store in the fridge in an airtight container. Will keep for 5 - 6 days. Can also be frozen for up to 3 months. Leftovers can be tossed through pasta for a quick and easy meal. Also great as a sauce drizzled on avocado toast, in paninis, or as a dip. This is a sponsored conversation written by me on behalf of Panago Pizza. I only ever recommend products that I truly enjoy & use myself & the featured recipe, opinions & text are all my own.